The same might be said of works of scholarship and writing. As it turns out, the Virginia Commonwealth University professor’s massive biography of arguably the most influential Supreme Court justice since John Marshall comes at an opportune time. A patient reader is left with the sense that lawyers, judges, public servants and, indeed, all citizens today face another period of historic choices. Examining the life of Brandeis, one concludes by the end of this remarkable book, shines essential light on how to balance loyalty to enduring verities with the demands for flexibility in assuring the nation’s future. Brandeis was born and raised largely in Louisville, Ky., to sophisticated and successful Jewish parents who emigrated from Prague. Eventually he would enter Harvard Law School, where he achieved the highest grade-point average in the institution’s history, a record that would stand for decades. After graduation, Brandeis commenced his law practice in Boston, establishing a firm that, resisting the modern waves of mergers and acquisitions that have turned law firms into commercial commodities, remains intact under the name Nutter McClennen & Fish. Brandeis’s brilliance and effectiveness as a litigator brought him not only wealth and fame, but also the admiration of minions who embraced his virtual invention of the notion that lawyers can, and should, do well while doing good. As his success grew, more time and energy went into public-interest work. 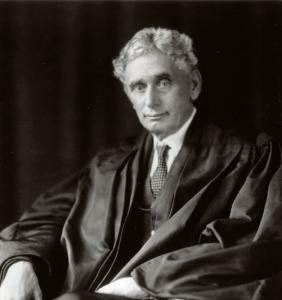 It was this combination of legal acumen and public spirit that led President Woodrow Wilson to appoint Brandeis to a deeply conservative US Supreme Court in 1916. At the time, static legal doctrines appeared headed for collision with a rapidly industrializing society. In guiding the law to accommodate new realities, while retaining values unique to the American experiment in government of and for a free people, Brandeis directed his formidable intellect and highly principled - critics would say rigid and even cold - character. Perhaps for reasons rooted partly in his being a Jew (albeit, a secular one) in a Brahmin society, he bore himself with a certain formality. But he nonetheless exhibited intense loyalty (he was a doting friend to the aging Oliver Wendell Holmes), devotion (without complaint he dealt with his wife Alice’s periodic bouts of depression, treating her always as his trusted partner), and mentorship to his law clerks, earning their devotion. He was an involved father to two precocious daughters, who pursued professional lives in an era when women more often tended the home fires. Brandeis was one of the most consequential figures in his world. As private lawyer, he deemed his first task to act as legal counsel, with his primary goal to keep his client out of trouble. If his client had to even enter a courtroom, that represented a failure. But when the advocate had to go to court, he had few if any peers. He created the “Brandeis brief’’ - a few pages of legal citations and precedents, but many pages of statistics, studies, sociological and scientific reports, and documents that added reality to the legal dispute being argued. This signature approach to litigation was to bolster theoretical argument with supporting evidence from the real world, an approach he took to the Supreme Court bench. Urofsky’s book has much to offer young lawyers and law students faced with life-defining, indeed society-defining, choices. Shall they offer themselves to the maws of the massive, lucrative, but some say soul-deadening machine that, distressingly, the business of law has become? Or might they use their talents, much as Brandeis did, to take on the large issues of the day even while in private practice - issues of civil liberty, elemental fairness and decency, as well as the maintenance of a legal system that is effective but retains a moral center? Brandeis is still remembered for taking on causes that did much to define Boston and Massachusetts, and later the nation. He managed to be progressive, taking on power elites and fighting for concessions on behalf of ordinary citizens and labor, all the while fighting tooth and nail to preserve freedom of speech, as well as the right to privacy (which he and his law partner, Samuel Warren, practically invented). In the modern era, when critics on the right would limit speech in the interests of order, and those on the left restrict speech purportedly to make life easier for members of “historically disadvantaged groups,’’ the lessons of Brandeis are increasingly urgent. Urofsky is at his best explaining Brandeis’s jurisprudence of free speech and of privacy. The author makes the convincing case that this justice, more than any other, laid the foundation for many of our current liberties. In a section with obvious implications for the post-9/11 nation, Urofsky demonstrates the practicality of Brandeis’s view that there are few circumstances when government has to limit freedom of speech and invade privacy. And when such actions become necessary, there is never an excuse for doing so outside the parameters of the law. Urofsky spends considerable time dealing with Brandeis’s views on economic matters. Brandeis’s 1914 book, “Other People’s Money, and How the Bankers Use It,’’ which cautions against industrial conglomerates - namely, that their unchecked growth produces human misery and can lead to financial collapse - is unavoidably applicable today. While there may seem a touch of the quaint in the justice’s notions of small government and the need to limit federal power so as not to unduly restrict the “laboratories’’ of the states nor tread upon liberty, the federal government’s dysfunctionality and abuse of power makes Brandeis’s concerns as relevant today as they were in his time. Urofsky has spent much of his professional life examining and writing about one or another aspect of this complex and multifaceted jurist. But this latest volume represents the pinnacle of Urofsky’s accumulated work. It will likely stand as the definitive Brandeis biography for many years.